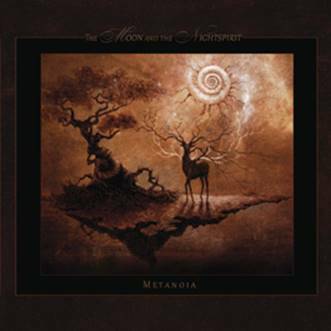 Ever since their inception, the name The Moon And The Nightspirit is metonymic with enchanting and melancholic folk music enhanced by a bewitching pagan aura where threads of ancient mysticism combine with phantasmagoric atmospheres. Now the Hungarian duo, namely multi-instrumentalists Ágnes Tóth and Mihály Szabó, returns with its sixth studio album, “Metanoia”. The group’s new work builds on its alluring, fairytale-esque explorations, delivering enveloping songs that are as gentle as they are powerful. Creating otherworldly music built on the backs of multitudes of instruments and the beautiful, ethereal vocals of Tóth, The Moon And The Nightspirit delivers its most impressive music to date and cements its place as frontrunners of the folk / world music landscape. As with previous The Moon And The Nightspirit albums, the lush, delicate artwork created by Tóth provides the perfect visual accompaniment to the duo’s sprite fairyworld. Meaning ‘a return to the pristine and pure path of crystalline existence’, “Metanoia” is an initiation, a rebirth, an awakening of the higher self, and the rekindling of an inner flame.